It is recommended that when installing more than 1 System component You do each separately. Example Injectors and Pump : Install whatever You believe to be causing the problem first, then start and run the truck to see if problem is solved, then move on to the next component. The reason behind this it makes trouble shooting simple and saves time. The fuel injection pump supplies high pressure to the fuel rail independent of engine speed. This high pressure is then accumulated in the fuel rail. High pressure fuel is constantly supplied to the injectors by the fuel rail. The Engine Control Module (ECM) controls the fueling and timing of the engine by actu­ating the injectors. Fuel enters the system from the electric fuel trans­fer (lift) pump, which is attached to the fuel filter assembly. Fuel is forced through the fuel filter ele­ment and then enters the Fuel Pump/Gear Pump, which is attached to the rear of the fuel injection pump. The Fuel Pump/Gear Pump is a low-pressure pump and produce pressures ranging from 551.5 kpa (80 psi) to 1241 kpa (180) psi. Fuel then enters the fuel injection pump. 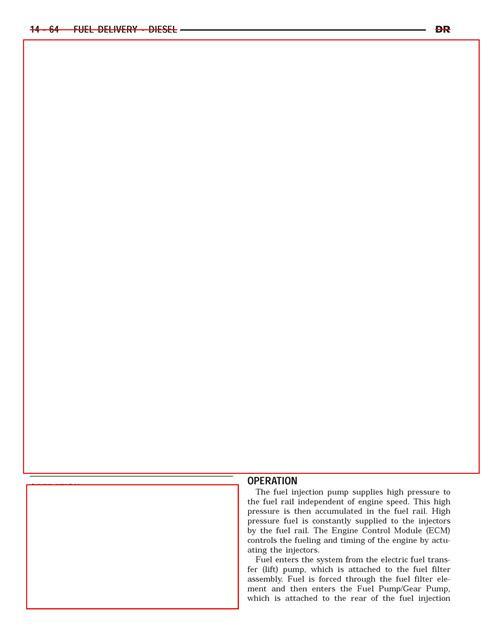 Low pressure fuel is then sup­plied to the FAC (Fuel Control Actuator). The FAC is an electronically controlled solenoid valve. The ECM controls the amount of fuel that enters the high-pressure pumping chambers by open­ing and closing the FAC based on a demanded fuel pressure. The FPS (Fuel Pressure Sensor) on the fuel rail provides the actual fuel pressure. When the actuator is opened, the maximum amount of fuel is being supplied to the fuel injection pump. 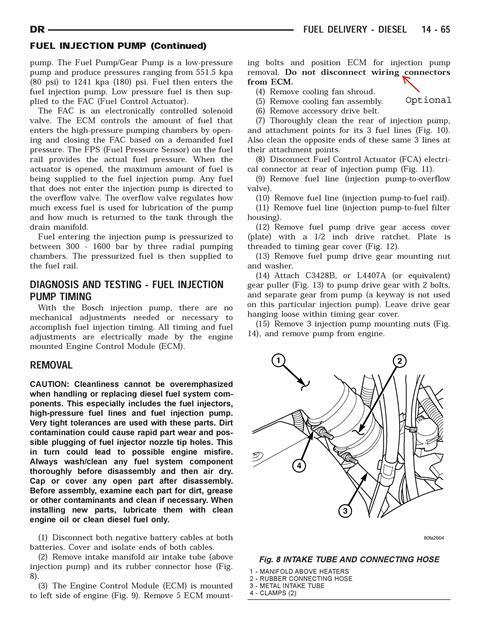 Any fuel that does not enter the injection pump is directed to the overflow valve. The overflow valve regulates how much excess fuel is used for lubrication of the pump and how much is returned to the tank through the drain manifold. Fuel entering the injection pump is pressurized to between 300 -1600 bar by three radial pumping chambers. The pressurized fuel is then supplied to the fuel rail. CAUTION: Cleanliness cannot be overemphasized when handling or replacing diesel fuel system com­ponents. This especially includes the fuel injectors, high-pressure fuel lines and fuel injection pump. Very tight tolerances are used with these parts. Dirt contamination could cause rapid part wear and pos­sible plugging of fuel injector nozzle tip holes. This in turn could lead to possible engine misfire. Always wash/clean any fuel system component thoroughly before disassembly and then air dry. Cap or cover any open part after disassembly. Before assembly, examine each part for dirt, grease or other contaminants and clean if necessary. When installing new parts, lubricate them with clean engine oil or clean diesel fuel only. (1) Disconnect both negative battery cables at both batteries. Cover and isolate ends of both cables. (2) Remove intake manifold air intake tube (above injection pump) and its rubber connector hose (Fig. 8 below). (3) The Engine Control Module (ECM) is mounted to left side of engine (Fig. 9 below). Remove 5 ECM mount bolts and position ECM for injection pump removal. Do not disconnect wiring connectors from ECM. (4) Remove cooling fan shroud. (5) Remove cooling fan assembly. (6) Remove accessory drive belt. 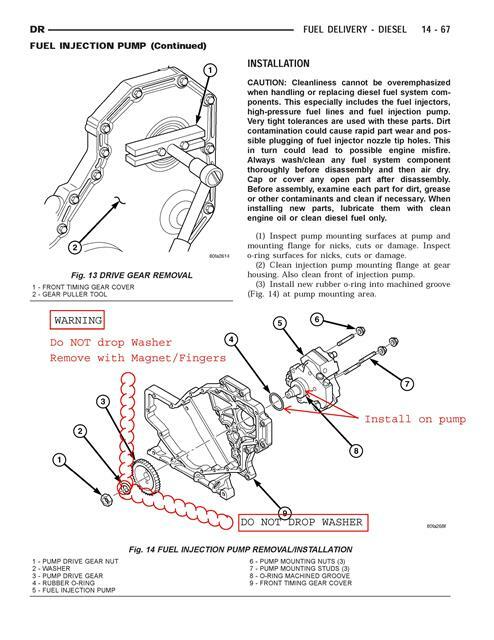 (7) Thoroughly clean the rear of injection pump, and attachment points for its 3 fuel lines (Fig. 10 below). Also clean the opposite ends of these same 3 lines at their attachment points. (8) Disconnect Fuel Control Actuator (FCA) electri­cal connector at rear of injection pump (Fig. 11 below). (9) Remove fuel line (injection pump-to-overflow valve). (10) Remove fuel line (injection pump-to-fuel rail). (11) Remove fuel line (injection pump-to-fuel filter housing). (12) Remove fuel pump drive gear access cover (plate) with a 1/2 inch drive ratchet. Plate is threaded to timing gear cover (Fig. 12 below). (13) Remove fuel pump drive gear mounting nut and washer. (14) Attach C3428B, or L4407A (or equivalent) gear puller (Fig. 13 below) to pump drive gear with 2 bolts, and separate gear from pump (a keyway is not used on this particular injection pump). Leave drive gear hanging loose within timing gear cover. (15) Remove 3 injection pump mounting nuts (Fig. 14 below), and remove pump from engine. (1) Inspect pump mounting surfaces at pump and mounting flange for nicks, cuts or damage. Inspect o-ring surfaces for nicks, cuts or damage. (2) Clean injection pump mounting flange at gear housing. Also clean front of injection pump. (3) Install new rubber o-ring into machined groove (Fig. 14 below) at pump mounting area. (4) Apply clean engine oil to injection pump o-ring only. The machined tapers on both injection pump shaft and injection pump gear must be abso­lutely dry, clean and free of any dirt or oil film. This will ensure proper gear-to-shaft tighten­ing. (5) Clean pump gear and pump shaft at machined tapers with an evaporative type cleaner such as brake cleaner. (6) Position injection pump to mounting flange on gear cover while aligning injection pump shaft through back of injection pump gear. (7) After pump is positioned flat to mounting flange, install 3 pump mounting nuts and tighten finger tight only. Do not attempt a final tightening at this time. Do not attempt to tighten (pull) pump to gear cover using mounting nuts. Dam­age to pump or gear cover may occur. The pump must be positioned flat to its mounting flange before attempting to tighten 3 mounting nuts. a: Install injection pump shaft washer and nut to pump shaft. Tighten nut finger tight only. b: Do preliminary (light) tightening of injection pump shaft nut. c: Tighten 3 injection pump mounting nuts to 8 N·m (70.8 in. lbs.). d: Do a final tightening of pump shaft nut to 105 N·m (72 ft. lbs.). (9) Install drive gear access cover (plate) using a 1/2 inch drive ratchet. Plate is threaded to timing gear cover. (10) Install Engine Control Module (ECM) to left side of engine. 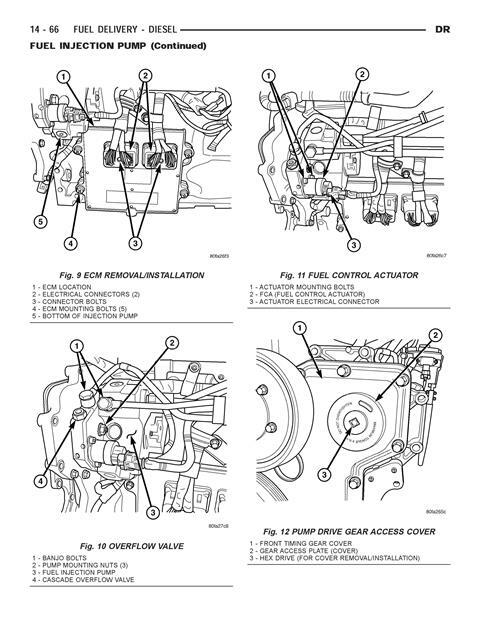 (11) Install fuel line (injection pump-to-overflow valve). Tighten bolts to 24 N·m (17 ft. lbs.) torque. (12) Install fuel line (injection pump-to-fuel rail). Tighten to 24 N·m (17 ft. lbs.) torque. (13) Install fuel line (injection pump-to-fuel filter housing). Tighten to 24 N·m (17 ft. lbs.) torque. (14) Connect Fuel Control Actuator (FCA) electri­cal connector to rear of injection pump. (15) Install intake manifold air intake tube (above injection pump). Tighten clamps. (16) Install accessory drive belt. (17) Install cooling fan shroud. (18) Install cooling fan assembly. (19) Connect both negative battery cables to both batteries. (20) Check system for fuel or engine oil leaks. Warning: Do Not over tighten Soleniod Nuts. They break easily. When starting do not crank for more than 3/5 seconds at a time. After 3 attempts and the vehicle does not start, contact us before continuing ( T&C Customers only).